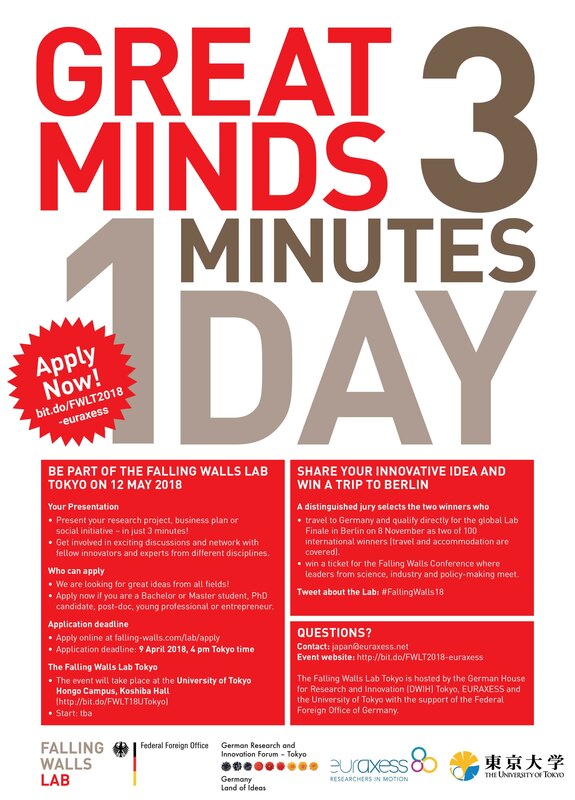 Learn, share and communicate about research: the Falling Walls Lab Tokyo (FWLT) will take place on 12 May 2018 in Tokyo! You can now register to attend the event! Further information & registration on our FWLT2018 webpage! The winners from the Falling Walls Labs from around the world - including the Falling Walls Lab Tokyo - will gather for the Falling Walls Lab Finale in Berlin in November. The Falling Walls initiative was founded to commemorate the fall of the Berlin Wall. The Falling Walls Lab Tokyo is co-organized by EURAXESS Japan and the German Research and Innovation Forum Tokyo (DWIH Tokyo).